This scenic drive (don’t let the word “Trail” fool you) is a section of the Southern Highroads Trail that passes thru Towns County along US 76 from one end of the county to the other from east to west or vise-versa. The entire scenic roadway tour is a 364-mile loop drive. The trip across Towns County is roughly 30-miles. 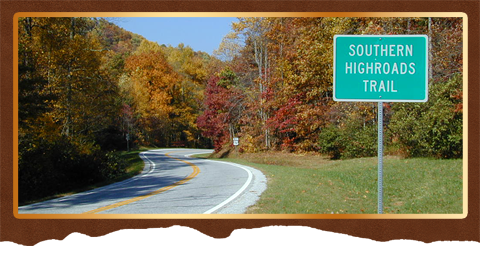 The Southern Highroads Trail travels a loop across North Georgia, a shorter section of Up Country South Carolina, then across far southwestern North Carolina to a shorter section of southeastern Tennessee before reconnecting back in Georgia. The Southern Highroads Trail crosses mountain gaps and valley floors, traveling through narrow gorges along rushing white-water rivers as it travels thru historic towns and beautiful countryside. Whether you prefer to take the short scenic drive thru the heart of Towns County or the longer trip along the Southern Highroads Trail, this scenic route offers some of the most beautiful mountain and valley areas in the southern Blue Ridge Mountains. Mrs. Highlander and I recently witness famed actor director and academy award winner, Clint Eastwood filming a scene for his movie “Trouble with the Curve” along a section of the Southern Highroads Trail in eastern Towns County. That can give you a clue to the beauty of this local region. Though the film crew temporarily posted a North Carolina State sign in the scene, it was western Towns County’s Upper Hightower region in the background. This GPS marks two sightings along the trail as it travels from one end of Towns County to the other.